"Feldsberg" redirects here. For the ruined castle in Carinthia, Austria, see Burgruine Feldsberg. For various similarly named settlements, see Feldberg. 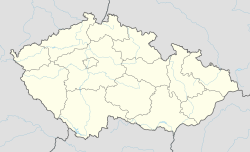 Valtice (Czech pronunciation: [ˈvalcɪtsɛ]; German: Feldsberg) is a small town in Břeclav District, South Moravian Region in the Czech Republic, close to the Austrian border. Valtice contains one of the most impressive Baroque residences of Central Europe. It was designed as the seat of the ruling princes of Liechtenstein by Johann Bernhard Fischer von Erlach in the early 18th century. Together with the neighbouring manor of Lednice, to which it is connected by a 7 kilometres (4.3 mi) long lime-tree avenue, Valtice forms the Lednice–Valtice Cultural Landscape, a UNESCO World Heritage Site. The town is located 265 kilometres (165 mi) south-east of Prague, on the railway line from Břeclav to Znojmo. In the south it borders on the Austrian municipality of Schrattenberg. Until 1919 Valtice likewise belonged to Lower Austria. The town is part of the European Centrope multinational region project established in 2003; all border controls have been abolished when the Czech Republic implemented the Schengen Agreement in 2007. The vineyards around Valtice are a centre of Mikulovská wine production, with notable wine tasting and trade at the "Wine Salon of the Czech Republic" in Valtice Chateau. Feldsberg Castle in the Duchy of Austria was first mentioned in an 1192 deed; held by the Lords of Seefeld, it was located close to the border with Moravia. In 1286 Duke Albert I of Austria vested the surrounding settlement with market rights. Feldsberg was elevated to the status of a town by Duke Albert III about 1383. The estates were acquired by the noble House of Liechtenstein, then Lords of neighbouring Mikulov (Nikolsburg), in 1394 and served as the dynasty's residence until 1939. The border town was devastated in the Hussite Wars in 1426, then again by the troops of the Bohemian king George of Poděbrady in 1458 as well as in the Austrian–Hungarian War by the forces of King Matthias Corvinus in 1480. The situation improved, when the Moravian lands in the north also became part of the Austrian Habsburg Monarchy in 1526. In the mid 16th century, the citizens turned Reformation, however, were subjected to the measures of Counter-Reformation under the rule of Karl I of Liechtenstein, who himself had converted to Catholicism in 1599 and in 1605 established a convent of the Brothers Hospitallers of St. John of God in Feldsberg. During the Thirty Years' War the town was again plundered by the troops of Emperor Ferdinand II in 1619 and conquered by Swedish forces under General Lennart Torstensson in 1645. After the war Prince Karl Eusebius of Liechtenstein had his domains rebuilt, including the 13th century castle according to plans designed by the Italian architect Giovanni Giacomo Tencalla with further Baroque extensions by Fischer von Erlach. Construction was supervised by Domenico Martinelli, who was employed as an on-site architect. The palace is surrounded by an English park with a colonnade and the Temple of Diana (1812) designed by Joseph Hardtmuth as well as other Neoclassical structures. Until the end of World War I the town of Feldsberg belonged to Lower Austria. According to the 1919 Treaty of Saint-Germain-en-Laye the town and its surroundings were annexed by newly established Czechoslovakia. The main reason was the requirement that the entire Znojmo-Břeclav railway line, a branch-off of the former Emperor Ferdinand Northern Railway, remain inside Czechoslovak territory. The Liechtenstein princely family lost its privileges with the collapse of the Austro-Hungarian Empire and by the then newly established state of Czechoslovakia in 1918, the predecessor of the Czech Republic. The town was occupied by Nazi Germany upon the 1938 Munich Agreement and incorporated into the Reichsgau Niederdonau. After World War II the remaining German population was expelled and the castle was confiscated by the Czechoslovak government; all claims for restitution have been rejected. The town is known as a centre of wine making in Moravia. Both the National Wine Center and the Wine Salon of the Czech Republic reside in the Valtice Chateau. The annual Valtice Wine Market wine exhibition is held in the chateau riding hall at the beginning of May. Wikimedia Commons has media related to Valtice. This page was last edited on 2 November 2018, at 03:21 (UTC).